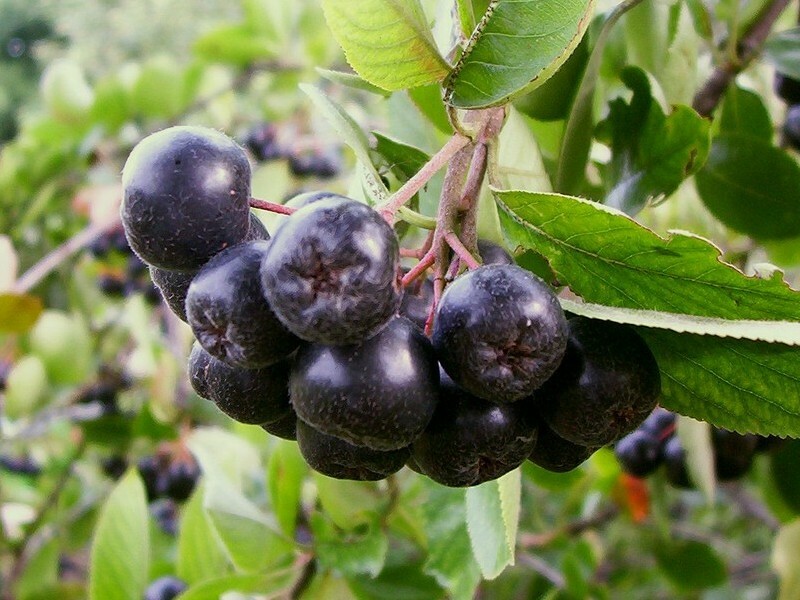 Aronia melanocarpa is a shrub to 3 m tall, colonial from root sprouts, twigs smooth, winter buds hairless, dark, or red, pointed. Winter buds with second bud scale half or more length of bud. Leaves alternate, to 7 cm long, widest above middle, dark green above, whitish, smooth below, small dark glands along midrib above and at tips of marginal teeth. Flowers white, petals and sepals 5, stamens numerous, May-June, pollinated by native bees Andrena carlini carlini, A. crataegi, A. wheeleri. A. miserabilis, A. thaspii, Lasioglossum cressone, Halictus sp. and European honeybees, Apis mellifera. Also visited by beetles, flies and moths. Also slightly self-fertile (Hall et al. 1978). Fruit fleshy, becoming red, then black, 1 cm wide, 1-5 seeded, ripens Aug.-Sept., often persistent into late autumn; seeds dispersed by birds. Seed load 6%. Pulp nutrients: water 72%, lipid 2%, protein 7%, CHO 29% (White 1989). Fruit and buds eaten by some birds, twigs eaten by deer and rabbits. Seeds eaten by mice (Martin et al 1951). Habitat: Moist edges and open woods. Also on salt marsh edges and back dune woodlands (Hough 1983). Acid soil, pH 5-6.5. Tolerant of flooding, drought, salt, soil compaction. Moderately tolerant of shade (Hightshoe 1988). Notes: Apparently not attacked by many insects. Infected by the fungi: Gymnosporangium clavipes, quince rust (Basidiomycotina), Podosphaera cladestina, a powdery mildew (Ascomycotina) and Isariopsis sp. the conidiophore spore producing state of Mycospaerella leaf spot fungi, producing tiny clumps of dark conidiophores (Ascomycotina) (Hall et al. 1978, Agrios 1988; Sinclair et al. 1987; Raven et al. 1986).